Iphone Active: The resurgence of the arcade genre on iOS: "Apocalypse Max: Better Dead than Undead"
The resurgence of the arcade genre on iOS: "Apocalypse Max: Better Dead than Undead"
Max Apocalypse: Better Undead Than Dead is a game for iPhone, iPod Touch and iPad, which puts us in the skin of the sole survivor of a zombie apocalpsis, so we have to get our hero suit and eliminate as many as we can through zombies different levels. 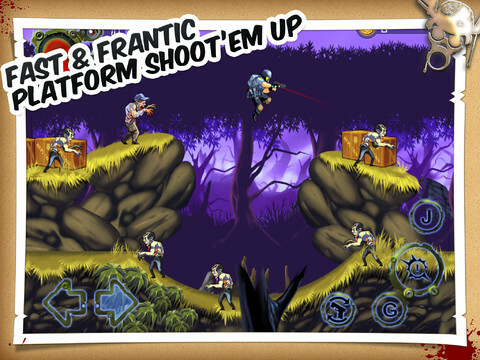 The game revives the frantic platforming arcade, Metal Slug style, but with graphics and HD day. Through 20 missions divided into nine worlds and with the help of 20 different types of weapons, we must eliminate the zombie plague and survive. If you like this kind of genre, sure Max Apocalypse: Better Dead than Undead will not be disappointed at all. It is also universal, so you can play it on any device with iOS.